Amateur Radio Clubs are encouraged to join ARRL members in supporting the Spectrum Defense Fund annually. Follow the lead of Temple ARC in Texas, a club that donates a portion of its hamfest proceeds. 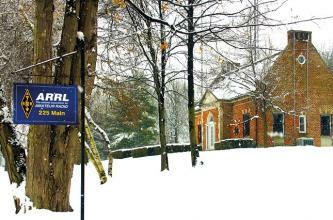 Ensure the future of W1AW, the Hiram Percy Maxim Memorial Station located at ARRL Headquarters in Newington CT. Secure the history of Amateur Radio by preserving the documents, images and artifacts that tell our century-old story. Your contribution will have an impact! ARRL invites contributions to one or more of the funds established to support programs not funded entirely by member dues. The ARRL Spectrum Defense Fund supports ARRL advocacy efforts in official Washington and worldwide to protect and enhance Amateur Radio frequencies. The ARRL Education & Technology Fund provides financial support the ARRL education initiatives in wireless technology including placing stations in schools and training teachers at the ARRL Teachers Institute. The W1AW Endowment Fund provides support for day-to-day operations, maintenance and capital needs of W1AW, the Hiram Percy Maxim Memorial Station. The Legislative Issues Advocacy Fund supports the mission of educating Congressional representatives, and their respective staffs, regarding issues that affect the Amateur Radio Service and ARRL's advocacy goals. The ARRL Lab Fund provides funds to cover the expenses of spectrum related research, equipment replacement and travel on behalf of Amateur Radio. The Historic Preservation Fund provides resources for the acquisition, preservation, storage and display of equipment and other memorabilia vital to the understanding and promotion of Amateur Radio history and traditions. The Legal Research and Resource Fund provides funding for research, expert opinions and the filing of legal briefs in proceedings related to Amateur Radio. The Ham Aid Fund was created in 2005 in response to the need for equipment and resources to support the Amateur Radio response to Hurricanes Katrina, Rita and Wilma. Ham Aid equipment is available on loan to Amateur Radio organizations during disaster response when communications equipment is unavailable. ARRL provides encouragement and support for the ARDF activities. The ARRL General Fund supports the mission of ARRL to protect, defend and enhance Amateur Radio. Questions about an ARRL fund?